The Ivy Rose Special Purchase Twin 15" Plush Euro Pillow Top Pocketed Coil Mattress and SupportFlex™ Foundation by Sealy at Beck's Furniture in the Sacramento, Rancho Cordova, Roseville, California area. Product availability may vary. Contact us for the most current availability on this product. 525444-1010 Twin 15" Plush EPT Mattress 1 15"
A special purchase, limited quantity mattress, the Ivy Rose Plush Euro Pillow Top, is a great value. 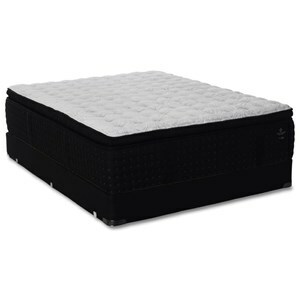 This thick 15" mattress is supported with almost 1,000 (960 Queen) Individually Wrapped Coils that will adjust to your body and give you that custom support needed for a good nights rest. Layers of comfort foam make this a Plush feeling mattress with additional lumbar support provided with Gel Foam in the center third. If you're looking to upgrade your current mattress or to impress your holiday guests with a luxurious feeling mattress, better hurry, these mattresses are limited! The Ivy Rose Special Purchase collection is a great option if you are looking for Mattresses in the Sacramento, Rancho Cordova, Roseville, California area. Browse other items in the Ivy Rose Special Purchase collection from Beck's Furniture in the Sacramento, Rancho Cordova, Roseville, California area.